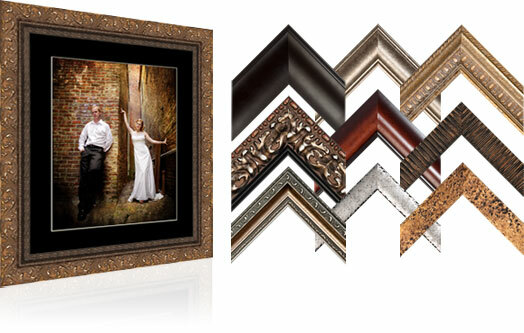 From 2″x3″ wallet prints to mounted 24″x36″ wall art, these lustre finished fine art prints have a 100 year+ rating. They will be cherished family heirlooms for generations to come. 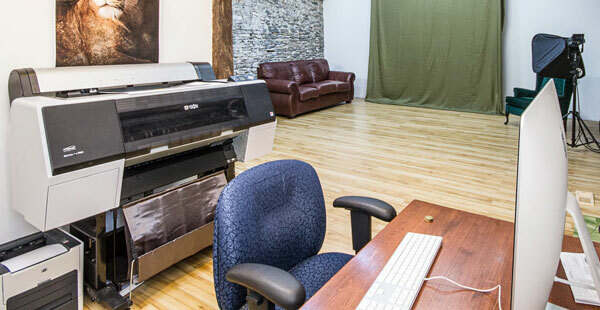 Lustre prints are produced in-house on our state-of-the-art, 300 pound, Epson printer. Printer supplied by Vistek | Canada’s Photo, Video and Digital Store. We are able to print directly onto real canvas fabric. The authentic texture of the natural fibres shows through the print. Canvases are stretched over 1″x2″ stretcher bars in the same way painters have been stretching canvas for their art for centuries. These can be hung as they are, or framed in either a fine art frame, or a premium frame. 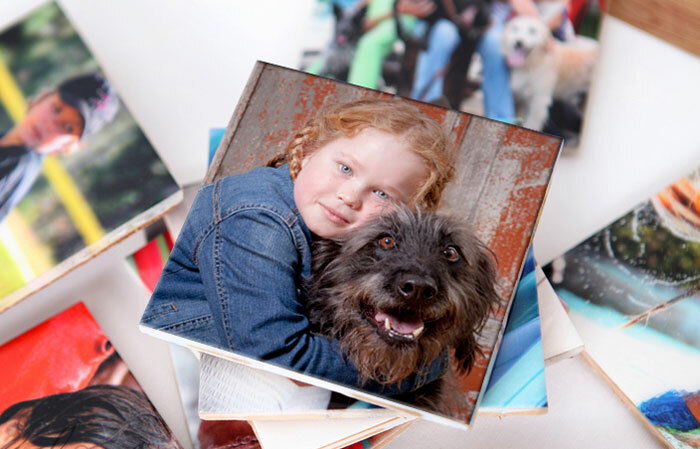 Canvases are printed and stretched in-house in giving you greater value for your investment. In the fine art gallery tradition simple black or dark brown 1″ x 2″ wood mouldings surround the print and brilliant white mat. Glass on the front and kraft paper behind seal the artwork to protect it from UV rays, marks, and dust. Gallery wrapped canvases don’t require a mat or glass, but they do get a UV protecting acrylic coating. Mounting wire and hardware are added so the artwork is ready to hang. These frames are produced in-house in order to keep your costs down and reduce production time. A wide range of moulding and mat combinations are available to take elevate your portraits to a whole new level. Most of these frames are custom made on demand in Toronto and take a little extra time to produce, but the extra few days wait ensures you are getting something special for your home. Until you have held a metal print in your hand, and seen the light dance and sparkle across its surface, you really can’t appreciate how amazing they are. Images are baked into polished aluminum panels and coated with acrylic protector to make them durable and scratch resistant. 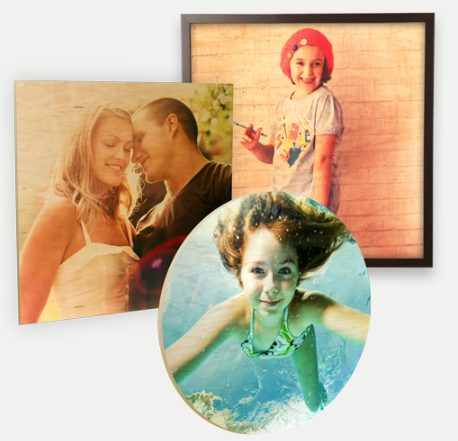 Flat metal prints using a floating mount system that gives the appearance the images are suspended off the wall. Curved metal prints are designed to stand by themselves on shelf or table. Flat metal is printed in-house, but curved metal is produced in a specialized facility in the United States. Create memorable pieces of art using Wood prints. 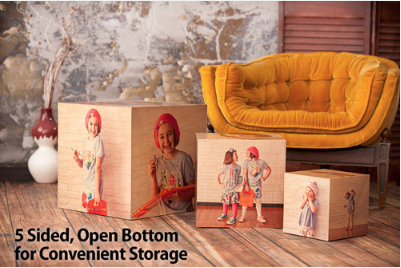 Wood is a natural option to display your finest images in a unique way. Made from maple multiplex and finished with a satin coating. Unframed wood prints have a 45-degree beveled edge and hanging slot across the back allowing for easy installation using two screws. Available in square, rectangle, or circle formats these wood prints look incredible in a cluster grouping on your wall. They can also be fitted with a rear extension to make them into a free-standing piece of art decor. Wood Design Cubes are a fantastic way to make a dramatic visual statement in your home or office decor. The natural wood grain adds a soft, rich tone to your images. These cubes are hand-crafted with a maple finish and satin coating with beautifully finished edges & elegant lines. These cubes are very strong. They could easily be used for coffee or end tables. Images printed directly onto ceramic tiles can be used in a variety of decorating options. The images are brilliant. 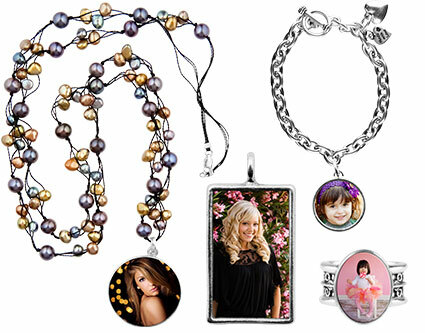 We now offer access to a complete line of personalized jewelry so that you can wear your most prized images. Our jewelry selection comes in striking sterling silver and antique silver-plated pewter that will beautifully showcase your portraits. This jewelry line has been purposely designed to combine pieces that offer affordable casual elegance with excellent quality of image. This elegant folio allows you to show off multiple images in a creative way. 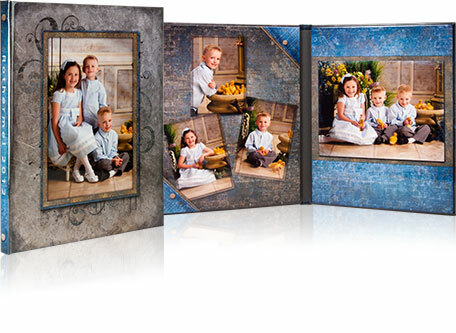 Created with a photographic cover and two image panels inside, folios allow for customized layout of the images and design. It makes a great gift for out of town relatives since it is very durable and ships well. When you experience the look, feel and style of our cards, you will want to share them with all your friends and family. The rich paper quality, the great colors and the finishing surfaces showcase photography in a way that sets them apart. Our cards come in a variety of sizes and uses – from the fun skinny mini, to our unique layered card – and in a large variety of papers with optional UV coating…your choices will seem endless! 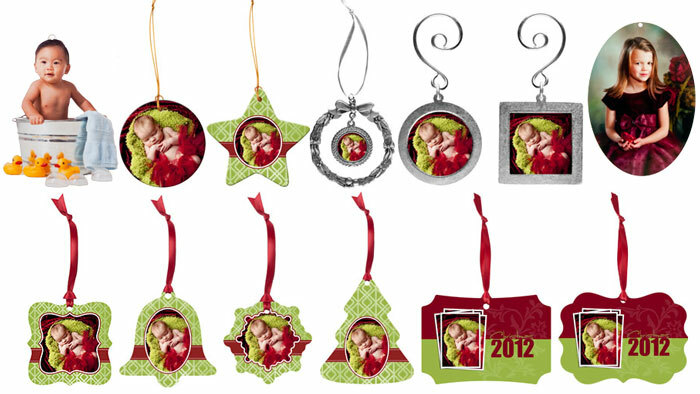 Ornaments make sentimental keepsakes to be treasured from year to year. Various designs are available in acrylic, porcelain, and metal. 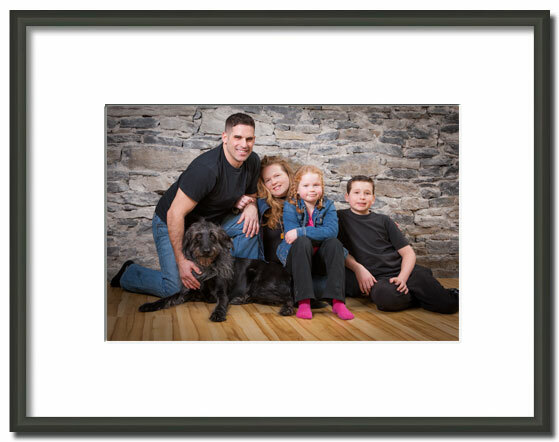 Quinte Studios is owned and operated by photographer Mike Gaudaur. 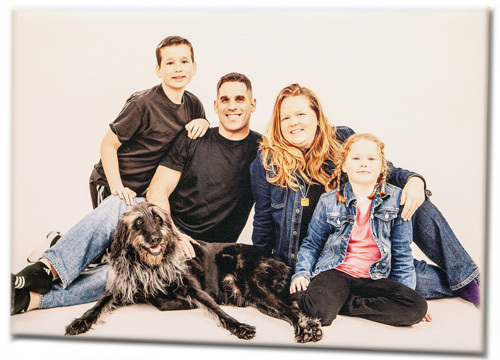 It is a full service portrait studio located in Trenton, right at the heart of Quinte West. 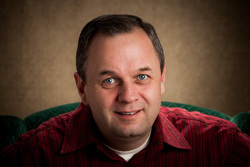 Mike has over 32 years of professional photography experience and 200+ weddings behind him. A huge part of any successful portrait session is the connection between the photographer and the subject. Mike's easy-going nature and years of classroom experience allow him to quickly break the ice and put his subjects at ease so that natural looking portraits can be captured. Give Mike a call, or fill in the Contact form, to set up a free consultation. Fill out this form and you will hear from us within 24 hours.